For his directorial debut, Ralph Fiennes teamed up with screenwriter John Logan (who previously penned The Aviator, The Last Samurai and Gladiator) to take on the tragedy Coriolanus. Written by Shakespeare in his later years, the original play has often been neglected, placed in the shadows of some of the Bard’s more celebrated “rise-and-fall” narratives. The story follows the titular Caius Martius Coriolanus (Fiennes), a war hero of high rank who finds himself at odds with the citizens of Rome. His contemptible views and words of disdain inflame the people around him (including manipulative politicians and his own scornful mother) and Coriolanus soon finds himself banished, drifting toward the factions he previously called his enemies. Fiennes places the story in a contemporary context — a world in which TV news acts as a kind of chorus and the working class lashes out at its officials with riots that appear all too similar to scenes from real life. The parallels to the modern world are intelligently rendered and Fiennes plays the central anti-hero with a compelling self-righteous fury. The supporting cast is equally strong, with Vanessa Redgrave, Jessica Chastain, Brian Cox and Gerard Butler (yes, even Gerard Butler!) turning in commanding performances. A source of light-hearted entertainment, this adaptation is inspired by Shakespeare’s The Taming of the Shrew. 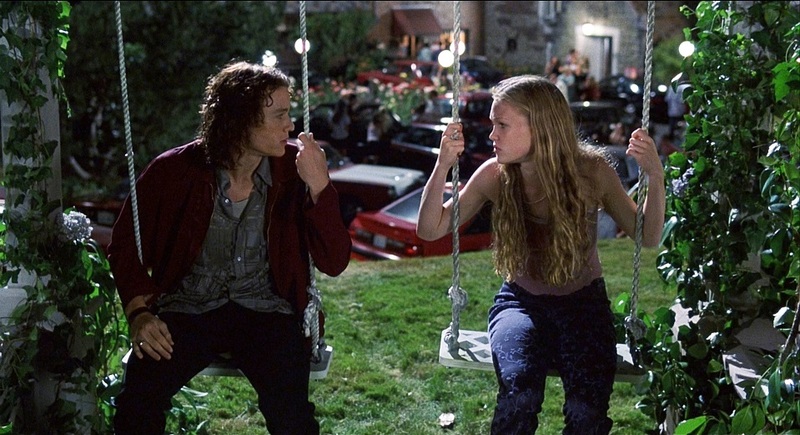 The story is centered on a high school and follows two sisters, Katarina “Kat” (Julia Stiles) and Bianca (Larisa Olyenik) Stratford, who are presented as complete opposites. Bianca is very popular, dresses in a preppy style, and follows the crowd, while Kat is a loner, dresses like a tomboy, and tends to go about doing things her own way, without paying any mind to what other people think. The plot revolves around an innocent dare in which Cameron James (Joseph-Gordon Levitt), a new student, develops a crush for Bianca and subsequently bribes a fellow peer, Patrick Verona (Heath Ledger), to pursue and date Kat, knowing that the sister’s father will let Bianca date only if Kat also has a date. In one of his first attempts to woo Kat, Patrick briefly interrupts her soccer practice by making a spectacle of himself lip-syncing to “Can’t Take My Eyes Off You (I Love You Baby)” by Frankie Valli. The stunt pays off, as it takes Kat by surprise and makes her interested in him. Supported by an ensemble cast, Stiles and Ledger take center stage and provide a balanced sense of chemistry in which they feed off one another. This ’90s film is one-of-a-kind and differentiates itself as a fun and smart take on Shakespeare that doesn’t aim to take itself too seriously. 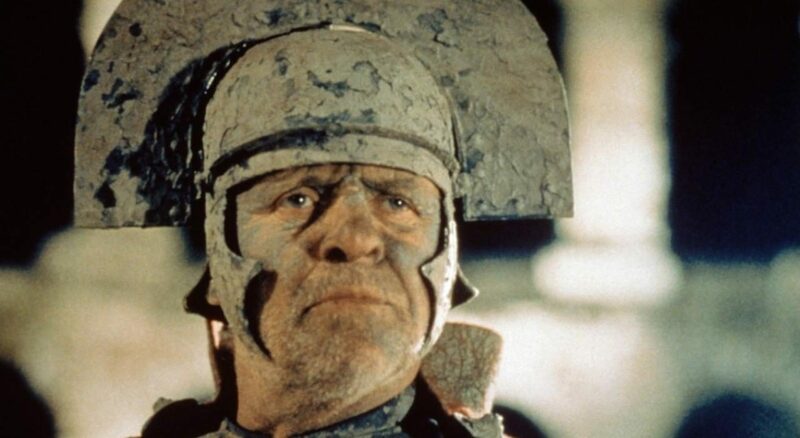 Julie Taymor’s adaptation of Titus Andronicus is a hard film to pin down. The story isn’t the easiest to describe, either. There are many parts moving and all you really need to know is that it’s an incredibly bleak tragedy of betrayal, revenge and self-loathing (so not exactly outside of Shakespeare’s wheelhouse). Defined by its highly eccentric manner, a tone that ranges from silly to depressing, and its spectacular sets and locations, Titus moves a lot like a Terry Gilliam movie. It’s a bold work capable of stirring the heart on a grand scale on occasion, but it also has several moments of self-aware absurdity. The design of the film is eclectic and feels both classical and modern at the same time (chariots and automobiles, traditional robes and leather pants, crossbows and rifles — all occupying the same space). This gives the themes of deceit and human cruelty an especially timeless quality that is made especially potent in the film’s transcendent conclusion. The sense of invention is intoxicating and no matter how strange or baffling it may sometimes get, Titus always feels like it’s pushing the envelope, creating an entirely unique vision of one of Shakespeare’s lesser-known plays. Few people will immediately associate She’s the Man with the work of Shakespeare. Starring Amanda Bynes, the film is loosely based on Twelfth Night. While this production offers a modern take on the play, the convoluted storyline is still there, yet simplified to fit the updated setting. The characters have unique personalities and show an unusual amount of depth for a teen dramedy. Viola Hastings (Bynes), a strong-willed, ambitious young woman and an absolute natural on the soccer field, finds that her team is cut instead of the boys’ team. Upon learning that her twin brother Sebastian (James Kirk) is going abroad to pursue adventures with his band, she agrees to cover for him, but in order to stay on the soccer field, she makes the hasty decision to pass herself off as him. Because of their striking resemblance, Viola is able to pull it off. She narrowly misses being caught on several occasions, but is able to fool her roommate Duke (Channing Tatum), her teammates, the coaches, and everyone else. She’s ultimately discovered, and although this draws criticism from some, the audience can see that her strategy ultimately paid off; she beat the misogynistic system, got the guy, played the sport and most importantly, she won the final game for the team. This film is clearly not what Shakespeare had in mind when drafting the original play, but it’s a thoroughly entertaining modern adaptation that everyone will enjoy for its laugh-out-loud humor. Bynes plays a very sympathetic character whom the audience wants to see triumph, and the film does a good job of infusing comedy into the inevitable crises that can occur when a girl masquerades as a boy in the dorm, on a date, and on the soccer field. Starring Mekhi Phifer, Josh Hartnett and Julia Stiles, O is loosely based on Shakespeare’s Othello. The film is set in a present-day American high school and documents teenage drama. 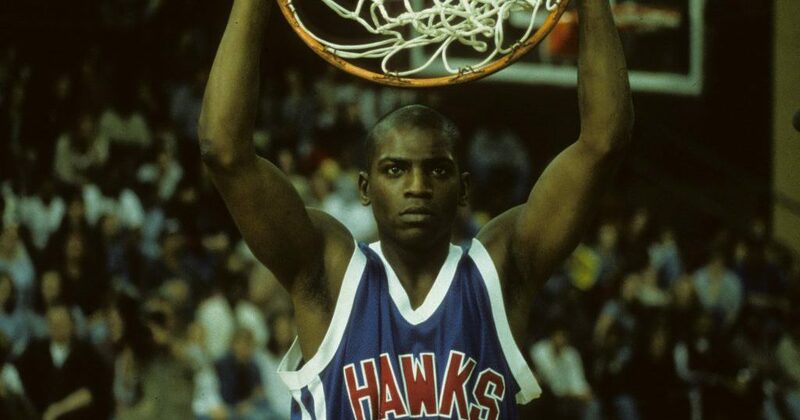 A central theme is the jealous behavior of player Hugo Goulding (Hartnett) toward teammate Odin James (Phifer), whose basketball skills are attracting, he feels, a little too much attention from the team’s coach, Hugo’s father. From there, the storyline follows the consequences of Hugo’s vengeful strategy. It was a smart move to have this adaptation focus on a high school basketball team where tensions and moments of pride coexist, playing out as a tug of war between students. Odin is the lone African-American player on the team — a fact that Hugo exploits to make him a target. The dark side of human nature is explored in this suspenseful drama, as jealousy, betrayal, and prejudice drive Hugo and Odin into a homicidal rage that ultimately consumes them from the inside. In one of the final scenes, Hugo has clearly become such a relentless aggressor that he has no remorse for the damage he has orchestrated. From the very beginning, we get the sense that evil is lurking and it’s difficult not to get hooked into the plot twists that reveal the nature of this evil, keeping the viewer engaged to a point where we have to know what happens next. The viewer knows early on that no matter what the outcome, Hugo will have blood on his hands, but we still want to know for sure what will become of the whole group. Last year, Australian director Justin Kurzel brought to the screen what might be the most brutally visceral take on Macbeth to date. Making very slight alterations to the original play, this iteration of the story retains the traditional 11th-century setting and doesn’t do too much to tweak the dialogue or core themes. However, the film is imbued with an overwhelmingly intense atmosphere. The lingering sense of death and impending ruin chokes the proceedings, as Kurzel paints his Macbeth in a color palette of oppressively somber greys, pale gold and eventually, fiery reds. Dread manifests in many forms. It’s in the perpetually overcast sky and the mountains that dwarf the characters. It’s in misty moors and ghostly figures. It’s also in a score that just breathes bad vibes. Supported by a trio of powerful performances — an icy, increasingly disturbed Marion Cotillard, a scene-stealing Sean Harris and a positively ferocious Michael Fassbender (aching with madness and regret in the titular role) — this Macbeth goes down as a riveting experience thanks to its instinctive, almost animal quality. The dialogue is beautifully performed, but you don’t have to be a fan of Shakespeare’s language to be engaged with this film. Bathed in blood, there’s no mistaking the savagery of Macbeth’s story here and every scene oozes with anguish both internal and external. Tags: Byron Bixler, Jacqueline Borwick, Shakespeare week 2016. Bookmark the permalink.